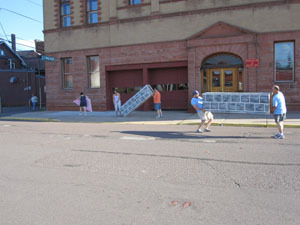 The 2010 Fall musical for the Calumet Players is “Once Upon a Mattress.” Yesterday was loadin for the show. The Calumet Players have a building across the street from the theater, and that is where the set is constructed. They have the cast and crew help carry everything across the street, into the back alley, and onto the theater stage. I always enjoy this part, because I get reacquainted with my old friends, and meet some nice new people as well. The loadin went fine, and I was thinking I’d be home early. I work in the flyloft, which is my favorite job in the theater. We had two set pieces to fly, and getting them hung and counterweighted is usually the biggest job of the show. Once counterweighted, almost anyone with a bit of training could raise and lower these things. Getting them safely attached and up in place so the sandbags can be attached is the challenge. It took three pretty strong guys and about a quart of sweat to get this project done. We left without having everything nailed down, but that is what tech rehearsal is for. It was warm in the theater yesterday, and it was hot here today. I wound up picking a sink full of ripe tomatoes and sorting them again. Those that were very ripe or blemished such that they wouldn’t last much longer I blanched, peeled, sliced, and layered in the dehydrator. Our tomato plants are going great guns right now, and I’d say that is a very nice problem to have. We have lots frozen and this is the second batch to be dried. And there are lots more on the vines. Today was our second annual fireman’s picnic. I got there around 8:30 this morning to help clean up and set up, and left around 6:00. It was a long day but I think everyone had a good time. We did a pretty good job raising money again this time too. There was lots of food, and I am proud of myself for resisting almost all of it. If our house had as much food out as this event did, I’d weigh 300#. I did set up my water moving thingy which I built last summer. No one used it for the longest time, so I finally grabbed two sons of one of our volunteer firefighters and showed them how to work it. After that lots and lots of people tried. This picture is from last year’s festival, because I didn’t take a picture of it this year. The object is to move water from the big tub to a 5 gallon pail that is just outside the frame of this picture by just pulling on the ropes. It can be done, but it is hard. Yesterday morning as Alice was leaving for work, we hatched a scheme whereby we would have a boating adventure on Lake Victoria (near Rockland) and then cap it off with dinner at Henry’s in Rockland. 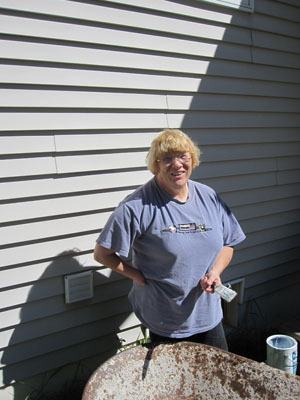 She had office hours from 1:00 – 4:00, and hopefully would be done sooner rather than later in the afternoon. I spent some time during the day loading our Grumman skiff on the trailer and getting the rest of the boating stuff organized and ready to go. It turned out that later was in the cards for Alice, and she didn’t get home until 4:30. She walked in the door and told me she was tired of making decisions, and that she was going to change clothes and I could decide what we would do that evening. I thought it over and decided to try the whole itinerary, although perhaps somewhat abbreviated. By the time she had finished changing, I had the trailer attached to the car and most everything ready to go. It took us a while to drive all the way to the impoundment (Lake Victoria is a lake created to produce hydroelectric power for the Upper Peninsula Power Company) and get under way. As we looked around, we determined we had that entire beautiful lake almost to ourselves. We motored to the far end of the lake, and when it got too shallow, I cut the motor and rowed for a bit. We rowed toward the place where the river enters the lake, and saw a guy in a canoe fishing in the distance, and decided to turn around and head back. It was a really nice boat ride, but both our stomachs were growling. We motored back this time with the wind behind us, and the little 1 horse motor really raced us down the lake. We packed up and headed for Henry’s, and had another of their magnificent Friday night fish fries. My friends, I have to tell you we both pigged out, but if there should be a “pig of the family” award, I would have won it. Alice was saying things like, “I’m eating slowly so I can enjoy it.” I responded with, “mgmph,” chew chew, etc. I’ve eaten food from across the planet, and I have to say that Henry’s Friday night buffet is my favorite. Last night and today I was afflicted with another headache, so I didn’t do too much. We did get our “dock sit” in, and other than that just a few chores. Tomorrow is the Fireman’s Picnic at the Tapiola Pavilion, so I’ll be busy with that all day. Hopefully I’ll feel better by tomorrow. This is our annual fundraiser, and so we try to put a lot of effort into it. It got cold last night. It was 41 degrees when I looked at the thermometer this morning about 6:30. It was cold enough that I went around closing the windows so no more cold air would come in. This is different from our philosophy so far this summer. We like to leave our windows open at night to get as much cool air in the house as possible, then keep them closed during the day. Even on the hottest days it feels refreshingly cool in the house when you come in from outside. Today I spent quite a chunk of my time with laundry. It was sunny, warm and breezy; a perfect day for hanging out. I didn’t quite fill the clothes lines, but I came pretty close. What a luxury it is to have the time to hang clothes outside on these perfect days. Everything smells and feels so fresh when it comes inside too. While the laundry was going on, I made some serious progress on the left wing of the Avion truck camper. I have everything roughed out and it is actually fitting in place now. I’ve made numerous trips from the camper to the shop cutting a bit here and a bit there until it slid into place. I still have a lot more work to do before I install it permanently, but it looks like the approach I’m using to get this done is going to work. I also watered the greenhouse garden with buckets this morning, and picked potato bugs off the plants in the outside garden. The potatoes are all that is left in the outside garden, and I figured I should keep after the bugs so I’ll have fewer next year. The potato bugs weren’t too bad this year. The potatoes will be ready to harvest soon. I usually enjoy that job… like digging for gold. First thing this morning I watered the greenhouse garden with buckets from the pond. I noticed lots of red tomatoes, so decided to pick them after the watering was finished. I got an almost full bag of them, some in better shape than others. Once inside I sorted them into two piles; one that could ripen for a while, and one that needed to be processed right away. The later group was chosen if they were very ripe, or had some sort of defect that would cause them to go downhill quickly. 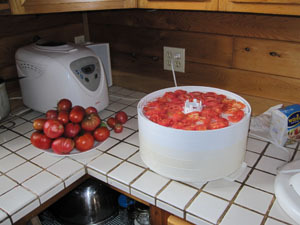 They were all washed, and I decided to use the ripe ones and dehydrate my first batch of tomatoes this season. I cored them and cut out all the bad spots. Then I blanched them for just a few minutes to remove the skins. I chose a sharp kitchen knife to slice each one and then placed them in the trays of the dehydrator. It is a slimy job, and one I don’t look forward to until I get into doing it. Once I get started, I enjoy seeing the trays of lovely fruit stack higher and higher. When the last one was finished, I plugged in the dehydrator and went outside. When I came in, the house smelled like heaven. There is nothing quite like fresh ripe tomatoes permeating every room of the house. 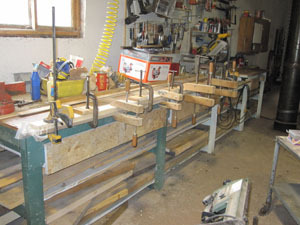 I did get out to the garage today and pulled the clamps off two more pieces of the camper. I have a few more to make, but I’m close enough that I can start fabricating the left wing as soon as tomorrow. It will be great to get it back to being structurally sound again. There is so much more to do with the camper that I hardly know where to go to next, but I’ll just try to keep my head into this project and tick off a project every now and then. I spent several hours today doing bookwork for two of the groups I volunteer for. I’m endorsing the checks for the fire department fundraiser and keeping track with a spreadsheet. I’m also the treasurer for FOLK (Friends of the Land of Keweenaw) so I had this month’s donations to take care of. I was about half way through them all when Franco came up to me, placed his ball on my lap, and then just looked at me. “I’m bored,” he was saying. I could well understand that, so I saved my files and we went for a nice walk around the property. Animals are very wise if you take the time to listen to them. Alice and I had a nice relaxing sit on the dock tonight after she came home from work. After that we made a leftover supper and watched some more of “Parrots of Telegraph Hill.” It is a real heartwarming story we are both enjoying. We should finish it tomorrow. 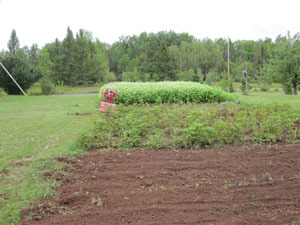 Yesterday I rototilled the buckwheat in both gardens. The outside garden had such fluffy soil it was like walking in bread dough. The buckwheat half of the greenhouse garden had not been watered in a long while, and it was more like cement. Both had healthy crops of buckwheat, though, which will enrich the soil for next year’s vegetables. This year I let this crop of buckwheat flower, which I haven’t done in the past. I’d like to say it was a strategic decision, but in truth I was just too busy to get it tilled until yesterday. I learned something, though. Insects LOVE buckwheat flowers. I believe in the future I will let my buckwheat crops flower as a favor to the local insects. 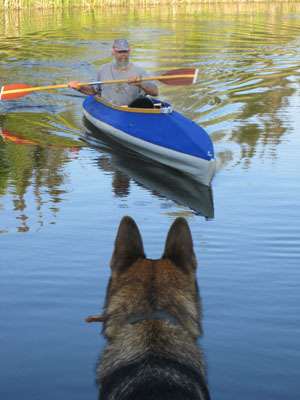 One other thing I wanted to accomplish this summer was to get Alice and I out in the Klepper kayak. We thought about the calendar, and realized today was the last day of summer. Alice goes back to work tomorrow, so it was today or never (not really, but it makes a better story that way.) In case you don’t know about these, the Klepper is a German kayak that folds down into 3 bags, and can be stored almost anywhere. We bought it thinking we’d bring it along when we take our trip in the camper. 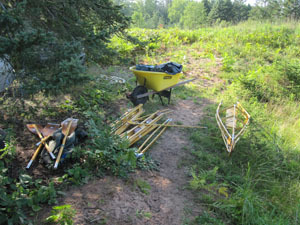 I loaded up the bags in the wheelbarrow and headed out to the back pond. 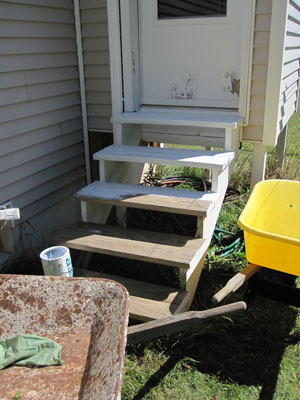 They say an experienced builder can put these things together in 15 minutes. I’m not experienced. The last time I put it together was about 2 years ago, so I had some relearning to do. After about 2 hours of trail and error, she was seaworthy. I took her for a short spin around the pond before I invited Alice to join me. The conditions were perfect and we had a very nice 15 or 20 minutes on the water. That’s right… 2 hours to build it and 20 minutes of paddling. We decided to put it away still together so we can take it out a few more times this year. I still walk up to the wood piles and give them a little pat now and then. I also walked out in the woods and brought the bulldozer home. 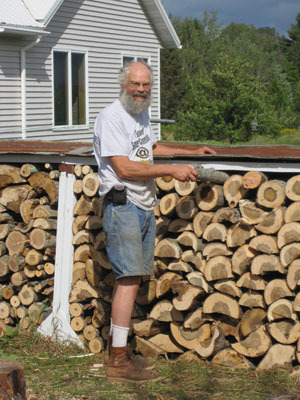 Next project for the dozer will probably be feeding cedar logs onto the sawmill for lumber for the Estivant Pines’ project. We had a nice rain last night. It was also rainy on and off until mid-afternoon. We really needed the moisture. I’ve neglected watering the greenhouse garden for a few days now, so today I got my trusty 5 gallon pails out and watered everything. 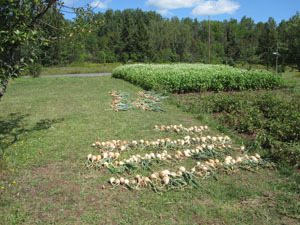 It was easier today because the sweet onions were already harvested. We have a bunch of red tomatoes again, which I hope to pick and process tomorrow. I did get out in my workshop today and made a component for the replacement wing for the Avion Truck Camper I’m working on. This is a 3 1/2″ wide by 1″ thick structural beam. When it is done it will have a 45 degree cut on it, and it will run the length of the overhang of the camper on the left side. I still need to make a similar one 1 1/2″ wide about 8′ long for the other side of the wing. 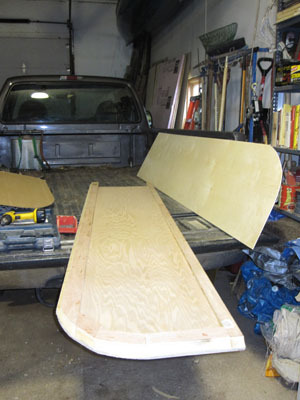 Quarter inch plywood will hold the whole thing together, and 1″ Styrofoam will go in the spaces for insulation. Hopefully more pictures of this rebuild will follow in the next few days. Our after-supper walk with the backpack and 50# of sand went well tonight. I feel like I’m getting stronger. I’ve been conditioning now for about 6 months, so should be in pretty good shape. I’ll need it all when the hike starts in mid-October. I finally got the onions picked today. The sweet onions are in the foreground, and the cooking onions are in the background. After they dried in the sun most of the day, I tied them up in bundles with binder twine, and hung them in the shed to dry some more. Just before the frost, we’ll trim the roots and stems, put them in onion bags, and store them in our Michigan basement. We’ve had pretty good luck with storing our onions over the years. We usually have good onions until the next summer. This year I put a label on each bundle. Other years we’ve been pretty sure we would be able to tell the sweets from the cooking onions, but when push came to shove, we sometimes couldn’t. It doesn’t matter so much if you cook with a sweet onion, but if you put a raw slab of cooking on your cheese sandwich, you are bound to make a face! I had purchased a new bigger and more powerful bench grinder for my shop a while back. Today I finally got it out of the box and bolted down to my grinder pedestal. When I turned it on it vibrated so much that I decided something was wrong. The thing wanted to dance across the floor! It is hard to do a precision sharpening of a drill bit if you have to chase your grinder around the room. So I called Performax tech support, and they told me to return it to Menards. Unfortunately, I bought it at the Menards in Escanaba, 150 miles and 3+ hours each way. I called Menards and they said I could return it to the one in Marquette if I wanted to, so I think I’ll do that. The other night I was doing my after supper hike, and a friend of mine stopped to chat. He happened to be there with his brother, who I had never met. They are both around my age. Both were overweight and both smoked. The brother had a nasal canula and was breathing oxygen. Clearly both had lived hard lives, and in their late 50s, looked like hell, to be blunt. It got me to thinking about the gift of life, and how important maintenance is. None of it is rocket science. Eat right, stay positive, and exercise. Avoid addictive drugs, and get plenty of fresh air and sunshine. For some reason, it is hard to be consistent with these simple principles. For my two friends I met on the road, it is probably too late to make any meaningful changes, but if you are reading this and are young, give the simple principles above some thought. The dividends won’t pay off right away, but the thing to think about is what do you want your life to be like in your 50s, 60s, etc? Today we put the last piece of firewood on the racks for this year. It has been a long process this year, with about 5 full cords (15 singles) cut, hauled, split, and stacked. The load I brought in yesterday finished the job nicely with a bit to spare. To celebrate, I walked directly to the hammock and looked up at the clouds racing through the lovely tracery of tree branches above my head. After a short rest (something just didn’t feel right about just lying there) I got up and we headed to Karvakko’s, where we bought ice cream, whipped topping, and potato chips, covering most of the basic food groups. At home I celebrated the end of the firewood project by making myself a mongo banana split and watching a TED. 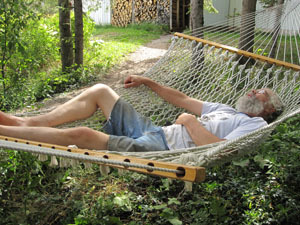 “Summertime, and the living is easy.” I spent a couple of hours putting tools away, raking the yard, hauling chainsaw chips onto the blueberries, etc etc. Things are back to being in good shape, and I’m ready to roll up my sleeves for the next project. 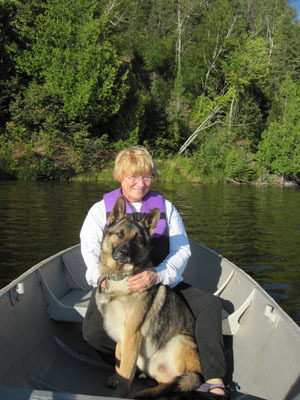 Tomorrow Alice is going to work, and Franco and I plan to make the trip to Copper Harbor to do some work in the pines. There are two student groups that have expressed interest in doing some trail work this fall, and I have to get organized so I’ll be able to keep them busy. I know these things can fall apart at the last minute too, but the prep work I’ll be doing will always be helpful, even if the projects carry forward to other years. We plan to spend some serious time just looking up at the trees tomorrow. 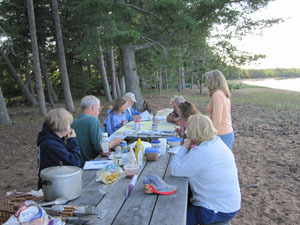 You are currently browsing the Rural Life in the UP of Michigan blog archives for August, 2010.